This list is in no order and is by no means all-inclusive. I actually had to cut it short from the original “25 ways to save $ in the kitchen”. So, I will share more tips at a later time, but here’s 10 for now! Sounds like a no-brainer, but far too often neglected. You know what I’m talking about. The quick “Hey Hubs, would you pick up ______ on your way home from work, please?”. We do our weekly grocery shopping and inevitably forget something. My motto is anything can wait a week. It’s a good heart check for what’s really needed. Also…this sparks creativity in the kitchen. I’m a much more versatile chef because of this! Wash out those sour cream tubs and pickle jars. Never spend money on containers! You purchase enough of them when you buy your food. Yes, that cost is absolutely built in to your total. Spend a few extra minutes washing them out to keep for later use. These are great containers to send leftovers home with your guests. That way they never have to worry about getting anything back to you! Eat your leftovers. Don’t be a snob! Plan your meals accordingly. Make Monday’s leftovers a new dish on Tuesday. Leftover stew, anyone? Also, don’t let your produce go to waste. Remember what you have on hand and use it before it’s too late! No lazy days where you pick up fast food when you already have food at home that will go bad by tomorrow. What a blessing that (aside from milk) the only liquid we truly need is practically free! Coffee drinkers might argue it’s a need as well, haha! Coffee and tea are cheap, so if you must have a little more flavor I’d recommend them. Especially over pricey sodas and juice. If you have the time (and I do right now, pre-kids), then take the extra time in the kitchen to cut some off your bill. Buy block cheese and shred it yourself, purchase whole foods, make as much as you can from scratch (even your snacks! ), etc. Cooking a lot of meals at once and freezing them can save in several ways. You are buying in bulk (almost always cheaper). You are saving time by only cooking once. You are saving soap and water by only cleaning once. A good tip on freezer meals is to cook with friends. Have a freezer cooking party! I recently attended my first and I’m excited to participate in more. Buy some cheap rags and use them in place of disposable paper towels and napkins. The cost to wash them is minimal compared to the cost of paper products. Again, if you must have your coffee, try and have it at home rather than paying for an overpriced latté. I definitely understand the draw of having a cup of coffee out with a friend. This is actually a tradition of mine with my good friend, Joy. Every time we are blessed enough to live in the same city (we’re 3 for 3 so far! ), we hit up every local coffee shop together over time. So trust me, I get it. I’m talking more about your day-to-day cup of joe. Turning on the oven to make something small, like garlic bread or fish sticks (yes, I still eat fish sticks! ), is a huge waste of energy. Use your toaster oven, or invest in one! Crock pots are always a good option. They use less energy than your oven and allow for a one dish meal which means an easy clean up! Also, use the correct burner size. Using a large burner for a small pot wastes energy. Contrary to popular belief, this does not heat your food any quicker. 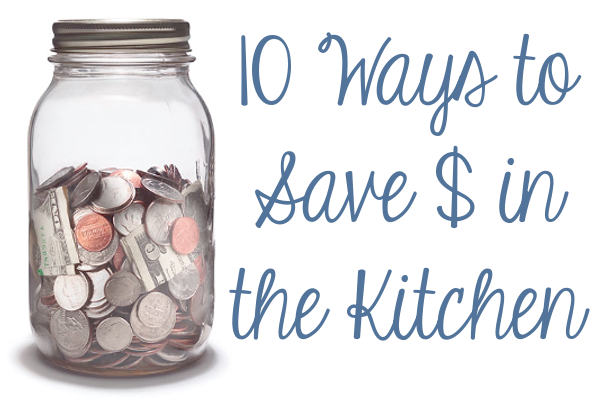 Hopefully these tips will be of some use to you when trying to pinch pennies in the kitchen. Look for my post on 10 more ways to save $ in the kitchen on Wednesday!